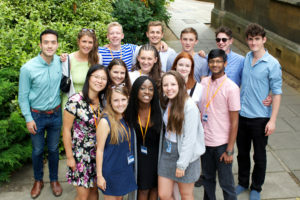 Win a scholarship to our Cambridge academic programme, and iPad, and more! Details of the competition, the guidelines, the prizes and important competition dates for your diary are outlined below. What is the Immerse Education Essay Competition? The Immerse Education Essay Competition provides the opportunity for students aged 13-18 to submit essay responses to a pre-set question relating to their chosen subject. Students of all nationalities who will be aged 13-18 during the summer of 2019. Our essay question is pre-defined but broad to enable you to tailor your response to reflect your interest in your chosen subject. Please note that this subject should be a programme offered by Immerse Education. Please complete the form below which will request your essay as a pdf document and photograph. Winning essays will be awarded with 100% scholarships covering the participation for a programme of your choice. Essays that are awarded runner-up prizes will be offered a partial scholarship of up to 75% of the participation fee for a programme of your choice. Content: The essay question is pre-set but broad and your answer should reflect your interest in your chosen subject. Inappropriate language, or content that might discriminate or cause offence will result in your withdrawal from the competition. Essay question: What problem would you like to solve, and how could your chosen subject help you achieve this?